Airwheel electric self-balancing scooter as a fresh, handy and eco-friendly personal transporter is known to more and more urban youngsters nowadays. It is set to make it debut on Båtmässan 2015 held in Gothenburg, Sweden on 31st Jan with representative models in every product line. Cars as the most common everyday transporter, have brought upon us severe pollutions and are consuming the precious non-renewable resources. Encouraged by the “Go Green” campaign, people today are seeking an eco-friendly transporter, and Airwheel is designed exactly for that purpose. In this year’s Båtmässan, Airwheel plans to present 3 most popular models: X3, Q3 and S3. X3 is a 1-wheeled model, which features ideal agility to play tricks on. Q3 is a user-friendly twin-wheeled model, controlled by Airwheel’s patented technology. And S3 is a 2-wheeled self-balancing scooter characterized by its sleek look and smooth riding experience. Airwheel electric self-balancing scooter debuts as a revolutionary eco-friendly personal transporter. Take S3 as an example, it is powered by a top quality Li-ion battery which also powers Tesla. In addition, S3 is highlighted by a 4in LED display, dual protection systems and intelligent Bluetooth connection. It suffices to say that S3 has a matching high-tech core with its attractive look. Established in 2013, Airwheel Technology Co., Ltd. is dedicated to developing trendy, handy and eco-friendly personal transporters in consistence with its slogan “Intelligent & Green Commute”. 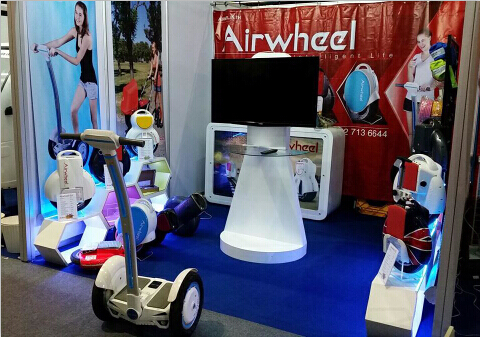 Airwheel Technology has grown to be a leading enterprise in the intelligent transport industry.